Welcome to Watching, The New York Times’s TV and movie recommendation site. “Brangelina” may no longer exist to feed the tabloids, but the glamour and tumult of Brad Pitt and Angelina Jolie’s relationship is preserved forever in Jolie’s “By the Sea,” an underrated melodrama that didn’t get much of a chance in theaters. Pitt and Jolie star as an unhappily married couple who hole up in a seaside hotel in France in the mid-1970s, hoping to rekindle their relationship, but they mostly retreat to their separate corners. That changes when they discover a hole in the wall and start spying on the newlyweds next door. Historical accuracy bends — and then cracks, and then shatters into a million pieces — in this 1998 costume drama, which conceives the rise to power of Elizabeth I as a tale of diabolical cunning and feminine resolve. Although “Elizabeth” brings a conspicuously modern perspective to events that took place in the 16th century, the film works as a stylish vehicle for Cate Blanchett, then a largely unknown actress who put herself firmly on the map with this film. Blanchett plays Elizabeth as a political naïf who grows into the role quickly and sees power as a means toward personal happiness. Jane Austen aficionados may blanch at the surface-level sleekness of this 2005 adaptation from Joe Wright, which couldn’t be further from the six-hour BBC standard from a decade earlier. But taken on its own terms, “Pride & Prejudice” is a fetching, romantic drama that still does justice to its source. Wright emphasizes the humble, mud-caked state of the Bennet home, which will collapse entirely if they fail to marry off their five daughters, including the headstrong Elizabeth (Keira Knightley), who doesn’t want her suitors chosen for her. Her suspicion of the wealthy Mr. Darcy (Matthew Macfadyen), however, yields to more complicated feelings over time. It may have been no more than a glorified PowerPoint presentation, but the 2006 documentary “An Inconvenient Truth” grossed $50 million worldwide, according to Box Office Mojo, won an Oscar for best documentary and forcefully advanced the debate on climate change, even if its arguments wound up meeting stiff political headwinds. Al Gore returns for a victory lap of sorts with “An Inconvenient Sequel: Truth to Power,” which underlines the prescience of the first film while looking toward innovative solutions to a growing crisis. New movie, same formula: A terrifying glimpse of the coming eco-apocalypse, brightened with a glimmer of hope. The Greek social satirist Yorgos Lanthimos follows up “The Lobster” with another beguiling oddity about the dark mysteries of human behavior. Colin Farrell again stars as a wealthy surgeon who enters into a friendship with a disturbed young man (Barry Keoghan) in an effort to seek redemption for a past mishap on the operating table. But when the surgeon brings him home and introduces him to his wife (Nicole Kidman) and two children, the stranger’s behavior gets more threatening and compels him to make some desperate decisions. Shot with the antiseptic chill of a Michael Haneke or Stanley Kubrick production, “The Killing of a Sacred Deer” nonetheless relieves the horror with inspired bursts of black comedy. Set around a purple motel in Kissimmee, Fla., a tourist trap in the shadow of Disney World, “The Florida Project” focuses on characters who can barely make the rent week-to-week, much less afford a trip to the Mouse House or take advantage of the cacophonous helicopter tours that take off nearby. Told mainly through the eyes of a six-year-old (Brooklynn Prince) who’s living with an unstable single mother (Bria Vinaite), the film is heartbreaking at times, but it is also rambunctious and funny, like a cross between “Dennis the Menace” and François Truffaut’s “Small Change.” As a put-upon yet compassionate apartment manager, Willem Dafoe embodies its unique soul. Once upon a time, Shane Black was Hollywood’s hottest screenwriter, parlaying his standard-setting buddy comedy “Lethal Weapon” into big paydays on “The Last Boy Scout,” “Last Action Hero” and “The Long Kiss Goodnight.” But his rebirth as a writer-director in the 2000s has brought out the noir-inflected wordplay (and smarm) that always lurked in his scripts, starting with the brilliant “Kiss Kiss Bang Bang” and continuing with “The Nice Guys,” which reimagines a “Chinatown”-type scenario as a bloody, sleazy, knockabout buddy picture. Russell Crowe and Ryan Gosling have great chemistry as a knuckle-breaker and a private eye who tackle a conspiracy that’s bigger than they can handle. Netflix is releasing a huge amount of Monty Python-related content on April 15, including the religious satire “Monty Python’s Life of Brian,” the legendary TV series “Monty Python’s Flying Circus,” and a host of live shows and supplementary materials. The most popular of the bunch is “Monty Python and the Holy Grail,” an irreverent goof on the legend of King Arthur and the Knights of the Round Table, with additional commentary on the miseries of medieval life and the absurdities of mythmaking itself. Few films have been quoted as religiously, so rewatch value is high. Every year, the Oscar nominees for Best Animated Feature include a couple of offbeat selections from outside Hollywood, and in 2017, one of those was “Loving Vincent,” a biopic about the life of Vincent van Gogh. What sets the film apart, however, is that it is the first fully painted animated feature: Each of its 65,000 frames is an oil painting rendered in van Gogh’s unmistakable postimpressionist style, a venture that required 125 painters working at an excruciatingly slow pace. The story focuses on a letter delivered to the last place van Gogh lived and an investigation into what happened during those final days. Director James Wan made the seventh “The Fast and the Furious” movie between the horror movies “The Conjuring” and its sequel, but he didn’t modulate his style from one to the next in the least — lending a distinct blockbuster maximalism to the “Conjuring” movies, in a genre that usually operates on a much smaller scale. “The Conjuring 2” runs an absurd 133 minutes, but the ghost-busting adventures of Ed and Lorraine Warren (Patrick Wilson and Vera Farmiga) rarely flag as they take on a vicious old spirit that has possessed a London home. As in the first entry, the Warrens have a strong, lived-in chemistry and Wan treats the haunted house like demented carnival ride of jump scares and demonic gizmos. The writer-director Ryan Koo, who founded the D.I.Y. indie website No Film School, makes his directorial debut with what sounds like a fictionalized version of “Hoop Dreams,” following the long-shot dreams of an 8th grade basketball prospect from the inner city. 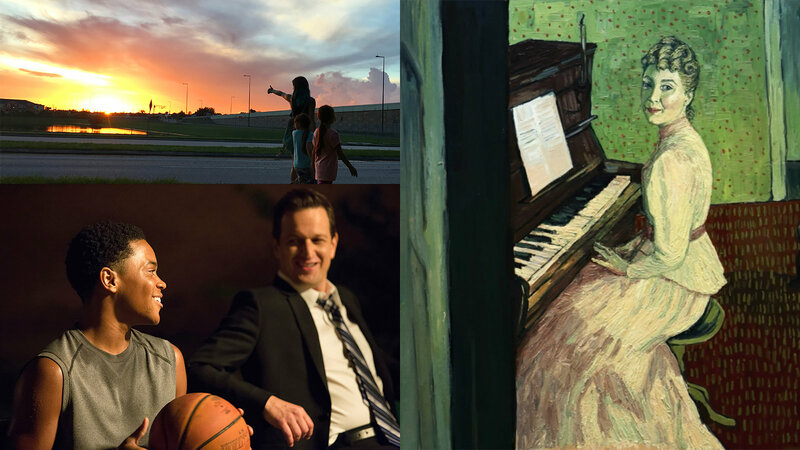 Funded by a hugely successful Kickstarter campaign, “Amateur” stars Michael Rainey Jr. as a 13-year-old guard whose dazzling skills lead to a viral video and recruitment to an elite prep school, where his new coach (Josh Charles) offers himself as mentor and father figure. But at this early stop on the road to professional hoops, the possibilities for exploitation and mismanagement far exceed the odds of making millions down the line. The South Korean director Yeon Sang-ho scored a massive hit in his home country with his 2016 horror-thriller “Train to Busan,” which distinguished itself from other zombie movies by having the undead hordes gobble up passengers on a bullet train through an apocalyptic setting. Yeon’s new film, “Psychokinesis,” arrives straight to Netflix after debuting in Korea in late January. It is another genre picture, but this time, Yeon tackles the superhero action comedy, following an ordinary man who discovers he can manipulate matter with his mind. With the notable exception of Noah Baumbach’s “The Meyerowitz Stories (New and Selected),” Adam Sandler’s multi-picture deal with Netflix has yielded some of his worst lowbrow comedies, including “The Ridiculous 6,” “The Do-Over,” and “Sandy Wexler.” Yet there’s reason to hope that “The Week of” may be an improvement, based on Sandler’s chemistry with his co-star Chris Rock and the gifted co-writer and director Robert Smigel, best known as the puppeteer behind Triumph, the Insult Comic Dog. “The Week of” stars Sandler and Rock as fathers of clashing temperament who scramble to marry off their children to each other. Veterans of the international film festival circuit will likely do a double-take in learning that Netflix has picked up a series from the Filipino director Brillante Mendoza, one of the current cinema’s most prolific and reliably controversial figures. And yet here’s “AMO,” a 13-episode crime drama about a high-school student (Vince Rillon) who sells crystal meth in a country that, under the iron-fisted rule of President Rodrigo Duterte, has brutalized drug dealers. With the street-level grittiness of previous work like “Ma’Rosa,” “Kinatay,” and “Serbis,” Mendoza seeks to reveal the human stakes of Duterte’s continuing drug war. The list of screenwriting credits for Matt Sazama and Burk Sharpless — “Dracula Untold,” “The Last Witch Hunter,” “Gods of Egypt” — don’t necessarily portend great things for their reboot of the 1965 science fiction series. But Netflix has been leaning heavily on sci-fi-action and nostalgia projects lately, and the service is investing a fortune into Sazama and Sharpless’s revised take on the Robinson family and how they adjust to being stranded on an alien planet. The unnamed robot still says “Danger, Will Robinson,” but based on its appearance alone, the kitsch of the old series has been dialed back completely. On top of its originals, Netflix has been casting out for choice imports, too, and the Australian series “The Letdown” looks like its answer to the domestic chaos of Amazon’s British series “Catastrophe.” The co-creator and co-writer Alison Bell stars as an uncertain mother who starts attending a support group for new parents but discovers that the moderator (Noni Hazlehurst) doesn’t treat her charges gently. With the support group as its organizing center, “The Letdown” dives into observational humor about the exhaustion and elation of motherhood and how it upends its heroine’s life. Also of interest: “Batman: The Killing Joke” (April 1), “Batteries Not Included” (April 1), “Dragon: The Bruce Lee Story” (April 1), “Fried Green Tomatoes” (April 1), “Krampus” (April 1), “Madagascar 3: Europe’s Most Wanted” (April 1), “Ride Along” and “Ride Along 2” (April 1), “Ash vs. Evil Dead”: Season 2 (April 2), “Black Lightning”: Season 1 (April 3), “The Boss Baby: Back in Business”: Season 1 (April 6), “Monty Python’s Flying Circus” (April 15), “Monty Python’s Life of Brian” (April 15) and “The Alienist”: Season 1 (April 19).